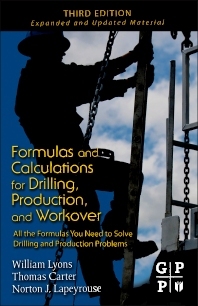 Formulas and Calculations for Drilling, Production, and Workover: All the Formulas You Need to Solve Drilling and Production Problems, Third Edition, provides a convenient source of reference for oil field workers who do not use formulas and calculations on a regular basis. This book is still intended for the entirety of their careers. It also aims to help reduce the volume of materials they must carry to the rig floor or job site. Starting with review of basic equations and basic calculations, the remaining chapters offer in-depth discussions of topics such as drilling fluids, pressure control, engineering calculations, and air and gas calculations. The formulas and calculations are provided in either English field units or in metric units. This edition includes the Volumetric Procedure, the Lubricate and Bleed Procedure (both Volume and Pressure Methods), and stripping procedures (both the Strip and Bleed Procedure and the Combined Stripping and Volumetric Procedure). The Table of Contents and the Index make looking up formulas and calculations quick and easy. Examples are used throughout to make the formulas as easy as possible to understand and work, and often exact words are used rather than symbols. Mr. Carter has over fifty five years' experience in domestic and international engineering and management positions in the area of drilling, completion and E&P waste management with Conoco, Baroid, and several other drilling contractors. He has conducted seminars and schools on fluids, rig equipment, and drilling engineering related subjects associated with drilling optimization, cost reduction, and well control. Tom has served as Chairman of the API standardization committee (SC 13) on Drilling and Completion Fluid Materials. He was a SPE Distinguished Lecturer in 1993 and served as the Editor of the SPE reprint series book on drilling fluids. Currently, he is a member of the Chevron Clear Leader Center serving as a Technical Learning Advisor in Houston. He coordinates and has teaching participation in several subject areas such as Coiled Tubing Operations, Directional Drilling, Drilling Fluids, Drilling Practices, Fundamentals for Drilling and Completion, HPHT Drilling and Completions, and Solids Control and Waste Management. He is still active in several industry organizations and was President of the Houston chapter of the American Association of Drilling Engineers, Coordinator for the SPE North American Forum Series, Membership Chairman of the editorial committee for the Journal of Petroleum Technology and on the Board of Directors for the Ocean Energy Center Society (Ocean Star rig museum in Galveston). He has published 20 technical publications and holds five U.S. patents. He graduated with a BS in Geology from Centenary College in Shreveport, Louisiana in 1963. Norton J. Lapeyrouse was a technical training instructor in oilfield courses with international experience. He developed numerous training programs, courses, and manuals designed for supervisory and field personnel. He was a member of the Society of Petroleum Engineers of AIME., the American Society for Teaching and Development, and the IADC. subcommittee of Well Control Trainers Roundtable.